Keep the focus on removing obstacles and barriers to growth. We very much welcome the new Commission’s focus on growth and jobs, and the commitment to better regulation. Protect market liquidity. If there is no liquidity, there will be no market. Banks are key liquidity providers for European markets. CMU must guarantee a level playing field. Allowing market participants to conduct similar activities to banks under lighter rules will disrupt the competition in financial markets. Address fragmentation in Europe’s financial services markets. Financial integration is tremendously important for the European economy. Correctly implement legislation that has already been adopted. In particular this is important for MiFID II and MiFIR, the Single Rule Book and the Banking Recovery and Resolution Directive. Well-calibrated and coherent implementation of this legislation will contribute to the development of CMU in Europe. Increase investors’ confidence in financial markets. The Commission must ensure that information provided to investors is relevant and reliable. 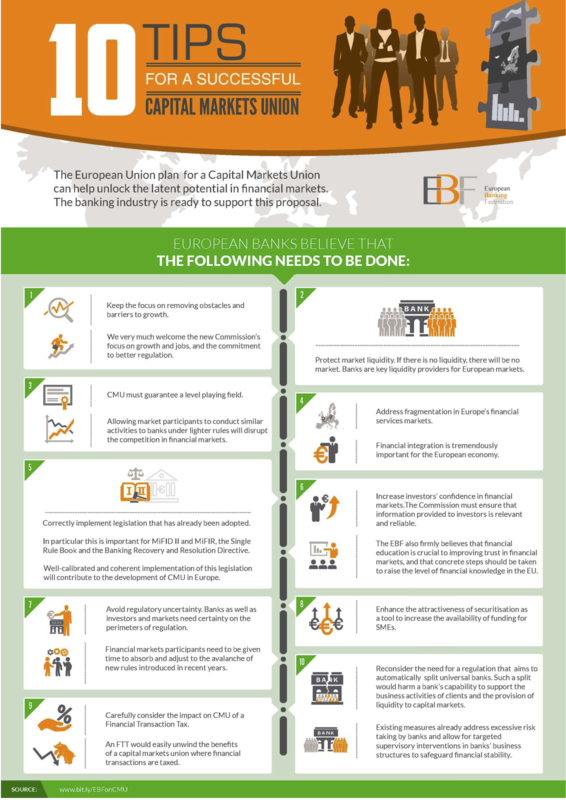 The EBF also firmly believes that financial education is crucial to improving trust in financial markets, and that concrete steps should be taken to raise the level of financial knowledge in the EU. Avoid regulatory uncertainty. Banks as well as investors and markets need certainty on the perimeters of regulation. Financial markets participants need to be given time to absorb and adjust to the avalanche of new rules introduced in recent years. Enhance the attractiveness of securitisation as a tool to increase the availability of funding for SMEs. Carefully consider the impact on CMU of a Financial Transaction Tax. An FTT would easily unwind the benefits of a capital markets union where financial transaction are taxed. Reconsider the need for a regulation that aims to automatically split universal banks. Such a split would harm a bank’s capability to support the business activities of clients and the provision of liquidity to capital markets. Existing measures already address excessive risk taken by banks and allow for targeted supervisory interventions in banks’ business structures to safeguard financial stability. Capital market and union both the terms are responsible for a successful business growth; every business man is looking for suitable capital and good market condition for the development of their business venture. Market condition is really beneficial for business venture and therefore we should go for suitable developing opportunities through capital market; as a business man we should learn some tips from here regarding capital market and business structure which is really helpful in business development.